The Moraine Mesocarnivore project was created to test new ideas about biodiversity, connectivity and conservation within Alberta. Francis Stewart, PhD candidate from the University of Victoria, is using this project, which began in 2014, as her PhD thesis. Together with Jason T. Fisher, senior research scientist and graduate advisor from the University of Victoria, she is investigating animal populations within protected areas. 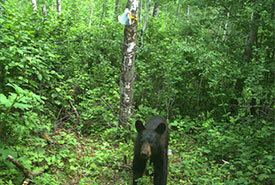 More specifically, she is examining the health of the fisher population in the Cooking Lake Moraine Natural Area. 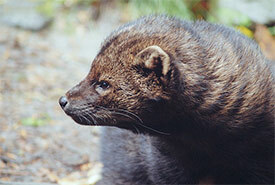 Fishers are small mammals, about the size of a house cat, that are native to North America. They are agile climbers, but mostly stay close to the forest floor to forage for food. Fishers are omnivores. They eat mostly fruits and mushrooms, but will occasionally prey on small rodents. Fishers are one of the only animals known to successfully prey on porcupines. Fishers were going geographically extinct from Alberta, due to unregulated trapping and habitat loss. In 1990, 20 fishers were reintroduced into the Cooking Lake-Blackfoot provincial recreation areas. The purpose of the Moraine Mesocarnivore study project was to judge if the fisher population had grown. 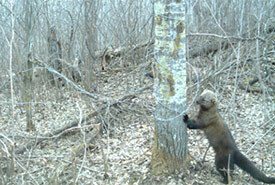 Researchers also aimed to determine how many of the current fishers had the DNA of the reintroduced animals. Stewart and Fisher put up cameras on several properties in the Cooking Lake Moraine area, including on the Hicks property owned by the Nature Conservancy of Canada (NCC) in partnership with the Edmonton and Area Land Trust. “NCC properties have provided an integral part of understanding how the landscape functions,” Stewart explained. The findings have indicated that the current fishers do not have the DNA of the reintroduced fishers from the 90s. These results show that at some point, fishers from northern Alberta have migrated south to the Cooking Lake Moraine. Understanding where fishers are on Cooking Lake Moraine is just one element of the project. The other aspect was to understand how mammals in general use different habitats across different landscapes. Stewart picked this as her thesis because she felt her time would be best spent looking into the world’s most pressing question: mainly, how to maintain biodiversity in the face of the ever-increasing human footprint. Alberta is an area of interest when investigating this important question. It represents one of the highest forest losses on the planet, surpassing the deforestation of the Amazonian rainforest (Global Forest Watch Canada 2014). “The Cooking Lake Moraine provided us with a model to understand how our actions are affecting biodiversity and how to best mitigate those impacts around the world,” Stewart explained. To learn more about the project, visit the Moraine Mesocarnivore Project website.